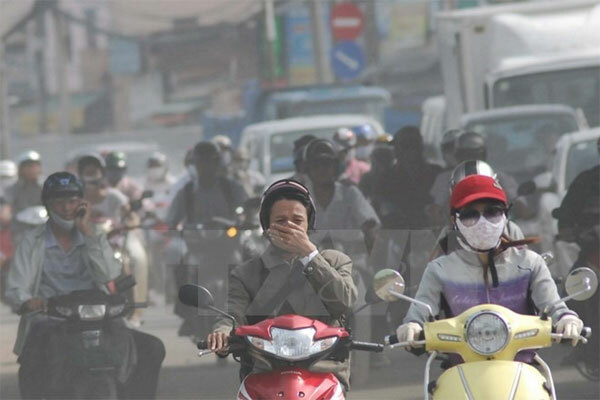 VietNamNet Bridge – Air pollution in HCM City caused by vehicles has become even more serious than the level of pollution emitted by industrial zones, environmental experts say. The amount of carbon dioxide (CO2) emissions in the city is estimated to be 38.5 million tonnes per year, making up about 16 per cent of the country’s total. Of the amount, CO2 emissions from automotive exhaust account for 45 per cent. With such alarming figures, the city is seeking ways to urgently reduce CO2 emissions, particularly from automobiles and motorbikes. In 2010, the city had 4.5 million motorbikes and 420,000 cars, but last year, the figure was 7.5 million motorbikes and 790,000 cars. By 2020, the number of vehicles is expected tol surge by 30 per cent, with nearly nine million motorbikes and 800,000 cars. Both cars and motorbikes discharge carbon monoxide (CO), CO2, nitrogen oxide (NOx) and sulphur oxide (SOx) into the atmosphere through exhaust pipes, flue gas stacks, and propeller nozzles. To minimise pollution, the Ministry of Transport’s Viet Nam Register has proposed raising the emission standard for cars to level 2. Specifically, the department has proposed reducing the CO emissions ratio for vehicles using gasoline from 4.5 (level 1) to 3.5 (level 2), and HC (hydrocarbon concentration) from 1,200 parts per million (ppm) to 800 ppm. Vehicles using diesel fuel will have to reduce emissions from the current 72 per cent HSU to 60 per cent HSU. Lam Dai Vinh, director of a private transportation company in HCM City, said that he supported changing the levels, but said it would affect residents and transport companies, especially small and medium-sized firms. He said that authorities should help transport companies, especially SMEs, by remitting some taxes and fees when the companies upgrade their cars to meet new emission standards. Besides the increased cost of upgrading their vehicles, the quality of domestic fuel is also an obstacle to raising emission standards. Most of the local fuel used for vehicles does not meet the European emission standard of 4, which can damage vehicles that have been upgraded. To meet the standards for better vehicles, the authorities should import fuel that will lower the costs of local companies, Vinh said. Cars and trucks with expired registrations are also a significant contribution to air pollution in HCM City. The law stipulates that vehicles that transport goods cannot be used for more than 25 years after the date of manufacture. The time limit for buses is 20 years. At the end of a vehicle’s legal life, car owners are supposed to go to their local registration offices where the paperwork can be revoked and the car destroyed. Officials rely on a car owner’s goodwill to turn their cars in. Most car owners do not want their cars destroyed and do not want to buy new ones. Besides, the fines for breaking the law are low, only VND4-6 million (US$187-$280), according to a decree issued in 2013. Many vehicles on the road are old and do not meet registration requirements, according to officials. Experts have said that limiting the use of personal vehicles in the city is another way to protect the environment. Economist Luong Hoai Nam said the city should improve the public bus system as it steps up efforts to restrict the use of personal vehicles. The first subway line of the metro will not be available for another few years. Worsening traffic congestion has been caused by poor management, short-term planning, and overloading of vehicles on most roads in the city, especially during rush hour, he added. To do it effectively, the city should conduct research on consumer demand for travel, improve co-operation among agencies, and develop a master plan for traffic with a clear roadmap, he suggested. Bui Xuan Cuong, director of the city’s Department of Transport, said the department was drawing up a plan that would include several solutions, such as a special consumption tariff and higher fees on personal vehicles, as well as an environmental fee to mitigate air and noise pollution caused by personal vehicles. The department also plans to limit the number of newly licensed vehicles through an annual quota, and require each citizen who wants to buy a new motorbike or car to bid for vehicle ownership. The number of personal vehicles has increased over the years. By November 2014, the number of personal vehicles in the city had increased to 6.95 million, including 580,000 automobiles and 6.37 million motorbikes. In 2016, the number of passenger trips on city public buses for the entire year was only 567 million, a drop of 1.39 per cent over the previous year, according to the Department of Transport. As of the first quarter of last year, the city had nearly eight million vehicles, of which motorbikes accounted for 92 per cent of the total number. The number of motorbikes rose by 5.4 per cent compared to the same period last year. By 2020, the number of vehicles in the city is expected to be around 10 million, including 800,000 cars. Most families in HCM City own at least one motorbike.